triphala – Harītakī, Baheḍā, Āmla. Just powder and use them as a life-giving drink! Since Charaka’s time, Indian physicians have extolled the virtues of harītakī or myrobalan, calling restoratives which include it by such picturesque names as ‘the unfailing’, ‘the restorative’, ‘the fearless against ill health’, ‘the life-giving’, and ‘the animating’. In some early Indian medical literature, it has been called Abyathā, which denotes the taking away of pain (byathā). It was favoured by such Graeco-Roman and Arab physicians as Avicenna, Scrapion, and Mesua. Through them, the plant became much in demand in Europe. Indeed, so widely was it known by 1610 that in his play The Alchemist, Ben Jonson has characterised a lady as being, ‘So light, she melts like Myrobalane’. Tamil medical literature designated 7 types of myrobalans. They were called abayan, amirtham, prithivi, sarojini, sivanthi, thiru-viruthi and vijayan. Some Siddha medical literature classifies the myrobalan into 4 types depending on the character of the fruit: karungadukkai (black-coloured skin), sengadukkai (red-coloured skin), vari kadukkai (ribbed skin) and paal kadukkai (exuding latex). 1. survarī haraḍe is large, dense and heavy, about 2 inches long with a yellowish-brown epidermis. When cut, it displays a yellowish or darkish-brown pulp. It is a valuable purgative. 2. Rangari haraḍe is small, about 1 inch long with a yellow epidermis; when cut, it shows a yellow dried pulp. The pulp is less astringent than that of survarī haraḍe. The Rangari variety of myrobalan is widely used against fevers, cough, asthma, urinary disease, piles, worms, rheumatism, and scorpion stings. 3. Balā haraḍe is smaller than the above two varieties. The epidermis is deep brown or black and highly wrinkled. The pulp is dark and homogeneous with no prominent seed. Balaa haraḍe is widely used against chronic diarrhoea, dysentery, flatulence, vomiting, hiccups, colic and enlarged spleen and liver. A cold infusion of balā haraḍe is used as a gargle for sore mouths and stomatitis, spongy and ulcerated gums. Prepared with rose water, it is cooling when applied to swellings. 4. Javā haraḍe is the smallest of all the varieties. Its characteristics are similar to those of balaa haraḍe. In general, myrobalans are safe and effective. According to the dose, it can be either a purgative or a gentle laxative. It is also an astringent. The unripe fruit is purgative while the ripe fruit is a milder purgative being astringent. The ripe fruit is the type commonly used as a purgative for removing excess bile and phlegm. Harītakī is a middle to large-sized deciduous tree with a cylindrical bole, rounded crown and spreading branches. The stem bark is dark brown, often longitudinally cracked, exfoliating in woody scales. The leaves are ovate, elliptic, glabrous, with a pair of large glands at the top of the petiole. The flowers are yellowish-white in colour in terminal simple spikes or short panicles. The fruit is glabrous, shining, ellipsoidal, in ovoid drupes, yellow to orange brown in colour, faintly angled and up to 4 cm long. The seeds are hard and pale yellow. This tree demands strong light. It requires direct light and cannot tolerate shade or any cramped situation. The young plants however can survive in a certain amount of shade and benefit by side protection from the hot sun. It also withstands fire well and exhibits a remarkable power of recovery from scars and burns after a fire. It is interesting to note that myrobalan obtained from the Salem district of Tamil Nadu of south India is considered the best because of its high content of tannin, pale colour as well as the paleness of the fruit extract. It is spread throughout India, in deciduous forests on dry slopes up to 1,500 m, especially in Bengal, Tamil Nadu and the Western ghats. It is commonly found near Chennai, Mysore and in the southern parts of the Bombay Presidency. The parts used are the immature and mature fresh and dried fruit called myrobalan and the galls. In fact, for medicinal purposes, the myrobalan fruit is usually picked green and dries black. Myrobalan contains astringent principles: tannin (tannic acid) 45%, and a large amount of gallic acid, lacilage, chebulinic acid and ellagic acid. The carbohydrates present in myrobalan are glucose and sorbitol (major constituents), about one per cent each of fructose and sucrose, a smaller amount of gentiobiose, and traces of arabinose, maltose, rhamnose and xylose. Eighteen typical amino acids of plants are also present besides small quantities of phosphoric, succinic, quinic, shikimic, and dihydro- and dehydro-shikimic acids. 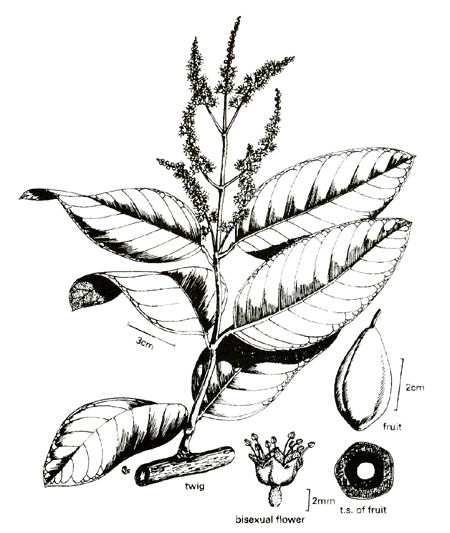 According to traditional Indian medical literature, myrobalan is astringent, sweet, acrid, bitter, or sour in taste. It is thermogenic, an anodyne (soothing pain), anti-inflammatory, vulnerary (curing eruptions), stomachic, laxative, purgative, carminative, digestive, anthelmintic, cardiotonic, aphrodisiac, antiseptic, diuretic, febrifuge, depurative (blood purfier) and a tonic. It is useful against wounds, ulcers, inflammations, gastropathy, anorexia, helminthiasis, flatulence, haemorrhoids, jaundice, hepatopathy, splenopathy, pharygnodynia (phanygeal pain), hiccups, coughs, uropathy, vesical and renal calculi, headache, epilepsy, ophthalmopathy, skin diseases, leprosy, intermittent fever, cardiac disorders, stomatitis, neuropathy and general debility. The chebulic myrobalan is extensively used in combination with the belleric (fruit of Terminalia bellirica) and emblic myrobalan (fruit of Phyllanthu semblica) as triphalā (meaning ‘three fruits’) and also as adjuncts to other medicines in numerous diseases. This is a vitamin-rich combination used in all basic health tonics of Āyurveda. Because of its astringent and antiseptic properties, this combination is also widely used in surgical dressings. Ancient writers recommended a compound decoction named pāthyādi kvātha, which is still used. It consists of myrobalan, pulp of cassia fistula, root of Picrorrhiza kurroa, root of Ipomoea turpethum and the fruit of Phyllanthus emblica in equal parts. The dose is 50 to 100ml. One teaspoon of myrobalan, fennel and sugar in equal quantities, taken once or twice daily is an effective laxative. Triphalā is also an effective laxative. A confection made of equal parts of the chebulic, emblic and belleric myrobalans, piper longum (pippalī), black salt and sugar is a widely used digestive. Recently myrobalan has been found to have a good effect on blood pressure, as a cardiac tonic. An ointment made of equal parts of myrobalan, quercus infectoria and a sufficient quantity of pure water is recommended for blepharitis. Water in which the myrobalan fruit has been steeped overnight is a cooling wash for the eyes, affording relief against conjunctivitis and similar eye conditions. A decoction of 200ml of myrobalan is taken orally, twice daily. A fine paste made by rubbing the fruit with a small amount of water is mixed with carron oil and applied to burns and scalds. Finely powdered myrobalan used as a dentifrice is also useful in carious teeth. It stops bleeding, relieves ulceration and strengthens the gums. Coarsely powdered and smoked in a pipe, it affords relief in case of asthma. A powder consisting of 5 parts of Terminalia chebula,4 of Terminalia bellirica,5 of Glycyrrhiza glabra,6 of coriander seeds, 6 of fennel (Foeniculum vulgare), 4 of anise seeds, 5 of rose buds,10 parts of sugar, is prepared. 10 to 20 grams a day is useful in relieving rheumatic pains. Myrobalan is taken every morning with salt during the rainy season, with sugar in autumn, with ginger in the winter, with honey in spring and with treacle in the two hot months. Apart from their value as a tonic, the dried fruits and seeds of myrobalan are prescribed in Āyurvedic medicine for such illnesses as dermatitis, oedema and urinary infections. The bark acts as a diuretic and cardiotonic. The kernels yield fatty oil, while the tree yields a valuable gum. The chebulic myrobalan of commerce is also used in dyeing and tanning. The dried flesh of the fruit surrounding the kernel is an important tanning material. The root bark and wood also contain tannin. The flower of myrobalan is one of the principal sources of tan due to its high ellagitannic acid content and is used especially in the production of sole-leather. Myrobalan is widely employed in E. I. tanning to fix a fine colour, and for resistance to light and aging. Galls found on the leaves yield a good permanent yellow dye when used in conjunction with alum. 4. Persons who have recently donated blood. Thus Harītakī or myrobalan or Kadukkai is known throughout the Indian subcontinent and its use is spread far and wide. 1. A.V.S.S. Samba Murthy and N.S. Subra-hmanyam. A Text Book of Economic Botany. New Delhi: Wiley Eastern Limited, 1989. Pages 482-483, 698, 700. 2. K.M. Matthew. An Excursion Flora of Central Tamil Nadu. New Delhi, India: Oxford & IBH Publishing Co. Pvt. Ltd., 1991, p. 189. 3. K.M. Nadkarni. Indian Materia Medica. Mumbai: Popular Prakashan Private Ltd., 1982, Vol.I: 1205-10. 4. K.R. Kirtikar and B.D. Basu. Indian Medicinal Plants, Vol.II. Dehradun: International Book Distributors, 1988, pp. 1020-23. 5. Naveen Patnaik. The Garden of Life. New Delhi: Harper Collins Publishers, 1993, pp. 60-61. 6. N.K. Shanmugam. Mooligai Kalai Kalangium. Chennai: Kalaiselvi Publications, 1997, pp. 148-49. 7. P.K. Warrier, V.P. Nambiar, C. Ramankutty. Indian Medicinal Plants. Chennai: Orient Longman Limited, 1996, Vol.5:263-74. 8. S. Kannusamy Pillai. Siddha Vaidhya Pathartha Guna Vilakkam (Moola Vargam). Chennai: B. Rathina Naikar & Sons, 1990, pp. 157-65. 9. The Wealth of India. New Delhi: Publications and Information Directorate, CSIR>, 1976, [Vol.X]: 171-77. 10. The Useful Plants of India. New Delhi: Publications & Information Directorate, CSIR, 1986, p. 628. Mr. N. Loganathan is a research scholar working on medicinal plants with a speciality in eye diseases in Tamil Nadu. When reproducing this feature, please credit NAMAH, and give the byline.Please send us cuttings.